Born on April 6th 1947 in Roundup (or Whitefish? 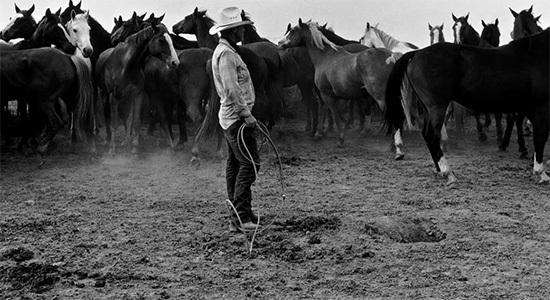 ), Montana, Kurt Markus was a writer and editor for Western Horseman Magazine before he became a photographer. His native region of Montana is very much a part of his pictures and he began his career by photographing the west: cowboys, horses and landcapes were his main focus and still are an important part of his work. He published three books presenting his work on the West and the cowboy life: After Barbed Wire (1985), Buckaroo (1988) and Cowpuncher: Cowboy’in in the Southwest (2000) that were acclaimed for the timeless beauty of their imagery as well as their realism, presenting the cowboy working life far from clichés though sometimes with poetism. Each one of these books focus on a different part of the West cowboys, which are divided into three groups: the cowboys (Montana, Wyoming, Colorado, Dakotas, Nebraska, Canada), the buckaroos (Oregon, Nevada, Idaho and California) and the cowpunchers (Texas, Oklahoma, New Mexico, Arizona), each one having different outfits, language and techniques. His other works as a photographer are very varied: he works for fashion magazines such as In Style, Vanity Fair, Esquire, Vogue, Harper’s Bazaar, ELLE and made photography for advertisement campaigns for brands such as Adidas, Levi’s, Calvin Klein, Armani, Nike or BMW. In publications such as Rolling Stone, GQ or Entertainment Weekly, he photographed many famous artists and, apart from working with Tori on Scarlet’s Walk artwork, he also made artworks for artists such as Jewel (for her album Goodbye Alice in Wonderland released in 2006), John Mellecamp, Ian Tyson or Amy Grant. Besides his books on cowboy life and the West, he published two other acclaimed photography books: Dreaming Georgia (1990) he made in New Mexico in tribute of painting artist Georgia O’Keefe, Boxers (1998), which presents in black and white pictures of boxers and he contributed to Dune: Edward & Brett Weston (2003), a book reuniting the most stunning dune photographs of the two renowned artists by giving his photographer’s point of view. He also traveled around the world to photograph landscapes and his work was exhibited around the world. His photographs are exposed in the Staley Wise gallery in New York, the Photology gallery in Milano and the Camerawork gallery in Berlin and in 1999 he won an award to the Life Magazine’s Alfred Eisenstaedt Photography Awards for his photoshoot "Sports Hall of Fame" with triathlete Peter Kotland published in Rolling Stone. Lately, he contributed to the exhibition "America the Beautiful" in New York, which owed him much praises. He lives in Kalispell, Montana, with his wife Maria and their two sons (who are following their father’s footstep into photography). Because he felt isolated in Montana and that photography is "in many respects a solitary profession", he managed to convince several magazines to let him interview many renowned photographers. He thus interviewed artists such as David Bailey, William Klein, Robert Doisneau, Willy Ronis and many others. About this experience, he said: "Each of these encounters has taken me out of my world long enough to be able to return to mine with renewed eyes."